No one wants to get swindled when they buy a used car, yet it happens all the time. 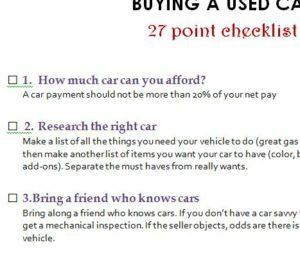 The free Buying a Used Car Checklist is your new way to ensure you’ve gone over the essentials for buying a used car. The template offers helpful tips that everyone should learn. You can see average car payment amounts, what to examine on the car, and so much more. If you’re considering a used car, you need this template to help you choose the right one. A car is a big investment to make and you don’t want to be stuck with something that doesn’t work, you can’t afford, or some combination of the two. Check out the free template by reading the guide below. You can start by examining the items on the sheet. These are items you need in order to judge a car for its value. Make sure you have everything you required on this list before going to the dealership. That includes bringing friends that know about cars, doing the research on the car you want, and examining key parts of the car. When you have everything checked off your list, you’ll know it’s time to look at some used cars down at the lot. If you can’t memorize these items, you can print the list to bring with you. To print the Buying a Used Car Checklist template, scroll back to the top of the page and select “File” then “Print” from the list of options that will be provided. As you browse the lot for your dream car, make sure you check off the items on your new list. This template helps you ensure you’re getting the best deal on your next used vehicle.